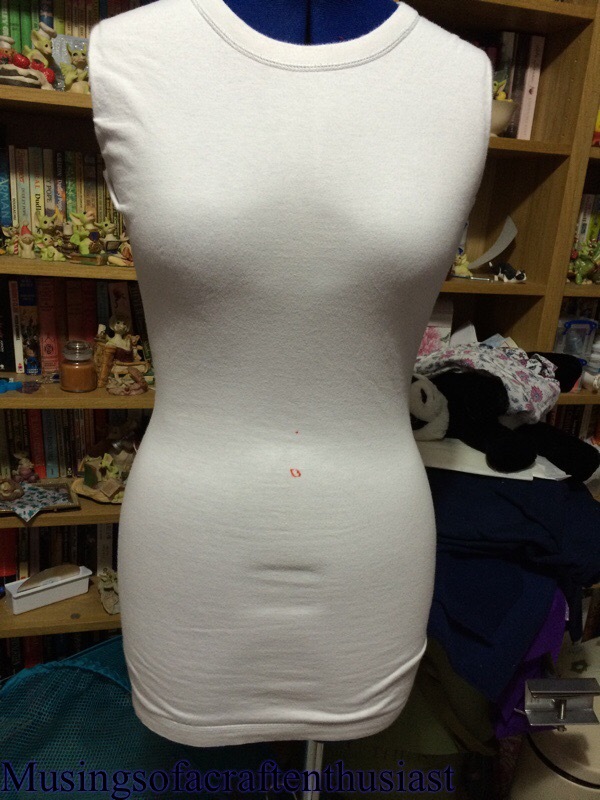 The biggest dislike of my dressmakers dummy is the fact the chest is very meh, there is no fullness to the underneath and not much slope to the top. I had to go into Kaye’s Saturday to buy a 20″ zip for my sheath dress and while I was there I noticed they had some quilting batting by the till, I’ve been looking into making my own shoulder pads and this is one of the fabric people have been suggesting using so along with my zip I bought 1/4 metre the smallest length could buy, now I knew that I wouldn’t need all that. First I took it down to the smallest size it would go which was still slightly more than my high bust but it was going to give me more scope on the bit I was more concerned about. 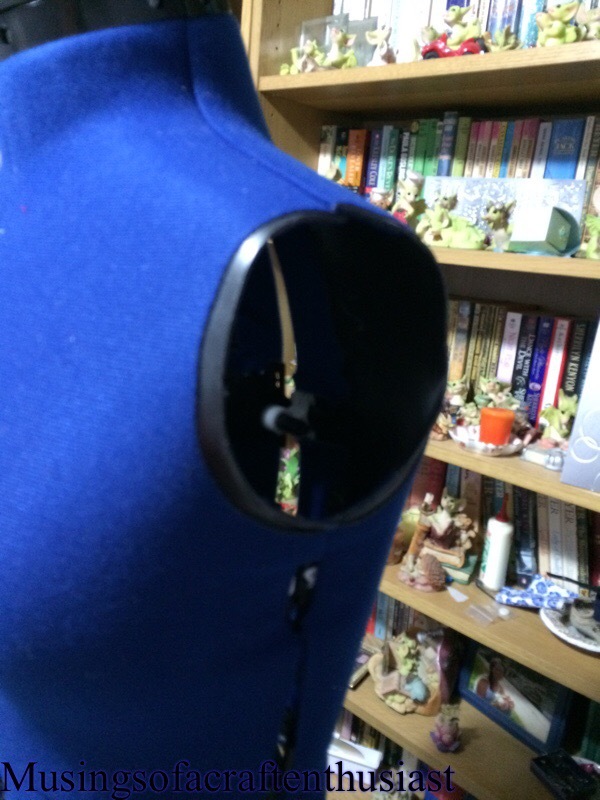 I bought a pair of raglan shoulder pads a couple of weeks ago to try in my kimono sleeved dresses/ blouses but they were too big, after rescuing one of them from the cats I pinned them to the chest of my dummy. After some ‘helpful’ suggestions from Simon about placement I then wrapped strips of the batting round them. Unfortunately not only did this approach mess even more with the high bust measurement it created havoc with the under bust measurement as well, they did look quite good though. I unwrapped the dummy and went back to the drawing board. 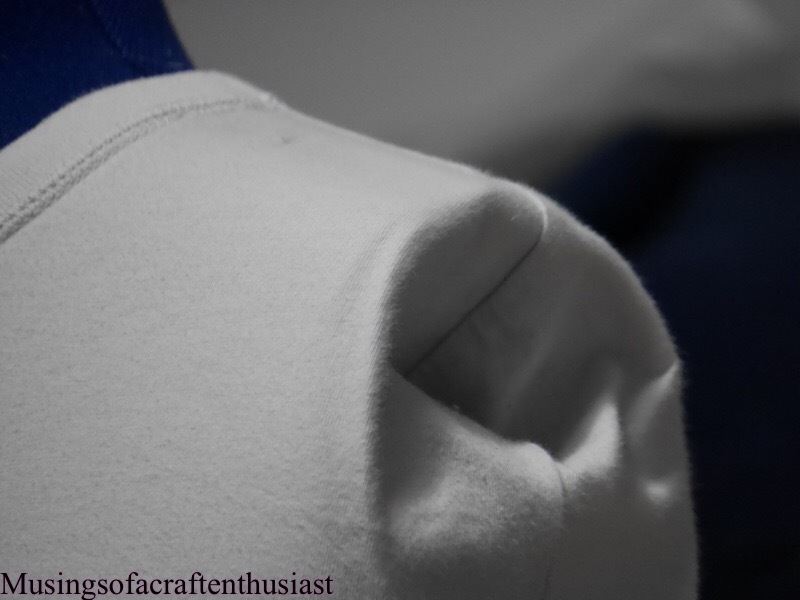 The next idea was to make a strip to go across the middle and wrap that up the result of this was a very nice shape, not as good as the one I got with the shoulder pads but the measurements all added up. 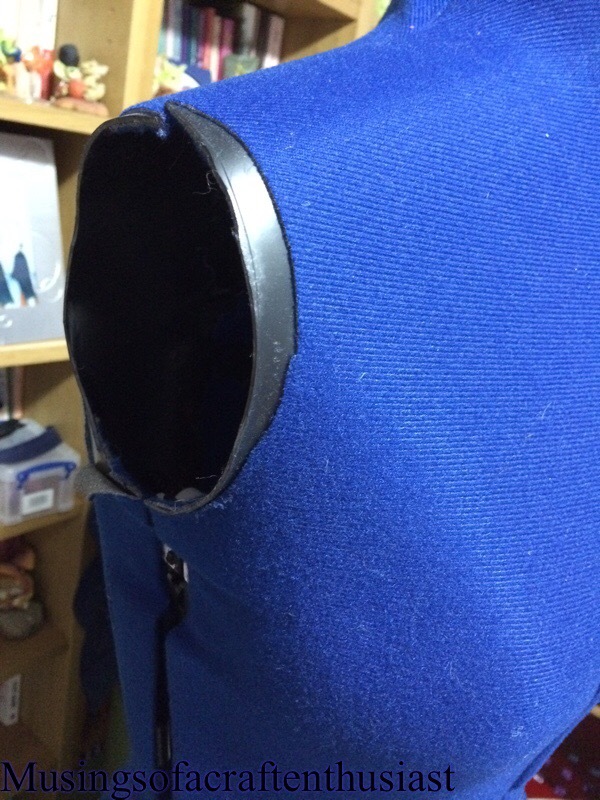 On the plus side I found a new use for the Raglan shoulder pads, which works better than the two pieces of cardboard I was using. 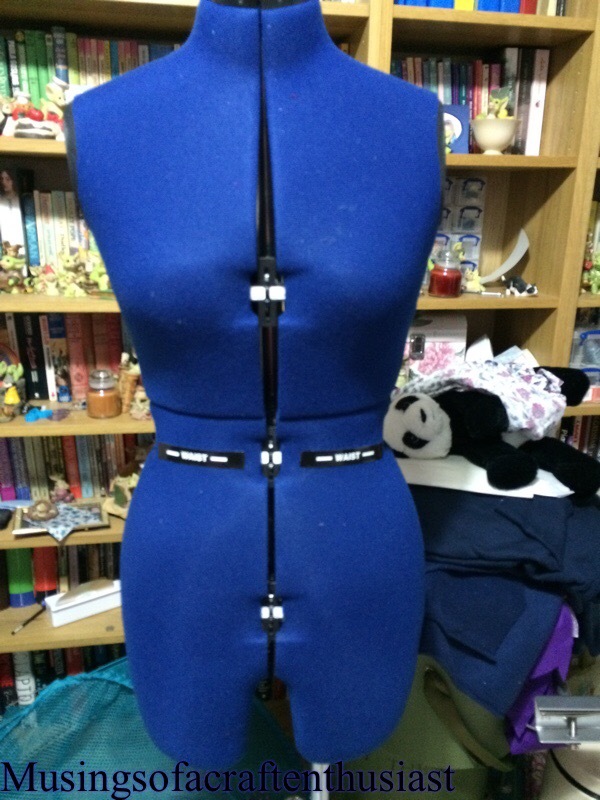 I have quite a nice dress makers dummy it is one of the ones with the dials on it to make it bigger and smaller, and I bought the one you could do trouser fitting on it. I got it last year, I’d always wanted one so I bought one, I quite quickly found the major downside to it, the shoulders, with the mainly 1950s dress I was making it was fine right up until I put in that pesky second side seam in, if the dress was big enough to go over the shoulders of the dummy it was too big in the chest for me, and even if it didn’t go over the shoulders it was more than likely to be too big in the chest. It was then I found out about dummys with collapsible shoulders (drool) I searched the net, I found out about wolf (very expensive) and PGM (not quite so expensive) but still in America so even if they would export to the UK you were looking at adding another £200 for shipping and import duty. Then I found out about Kennett and Linsell goody, I thought, they are in the UK not sure why my google searches didn’t find them, but it must be cheaper to buy from here than the States (wrong!!!! )as far as I can work out as they don’t have any prices listed it costs about £700 for one of these dummys. This is going by the Clearance list, and an auction on ebay. So off to the back room where we had a few bags of clothes waiting to go to the charity shop, Simon had put a couple of t-shirts in there, ideal, they would be nice and long and I’d have some fabric to play with. 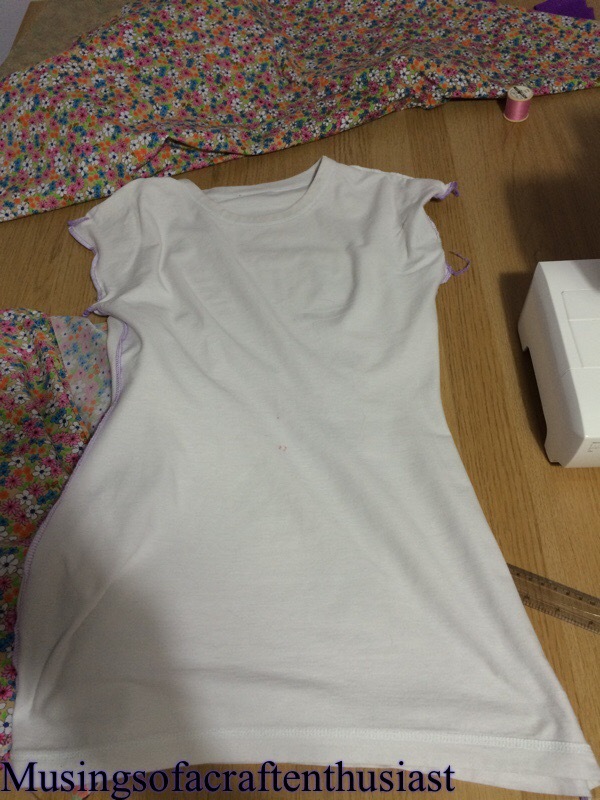 I stitched the sleeves up and took the t-shirt in using my overlocker, why not get a feel for knits at the same time as trying to make my dressmakers Dummy actually usable. Here is the finished article it still has enough shoulder to hang a dress from, but it is missing just enough that I can get my 1950s dresses on it, still with a struggle but less chance of splitting the under arm seam.